There are many paths to writing for children. Still, some might be wondering how today’s spotlight author traveled away from the glitz and glitter of Hollywood to the trenches of kidlit. Her journey speaks to the power of the pen and how passion for representation burns in all of us. I was starting to feel helpless when it came to navigating Hollywood and my work as an actress. There were so many blatant stereotypes and caricatures when it came to the way people of color were and are represented. I didn’t want to feel helpless anymore. I wanted to take back my power. And so I started writing books and screenplays about 8 years ago because I wanted to be a part of this beautiful movement of storytellers who are making sure that people of color are no longer being reduced to sidekick or blatant stereotype. There should not be a go-to narrative for people of color. Our stories should be as unique and varied as we are as a people. My daughter is autistic. Not gonna lie. Life can be challenging. That’s putting it mildly. I had to cut back on work to care for her and help her learn to speak and socialize and… it was a lot. I lost many things in my efforts to help and guide her. At my lowest point I had no money, no career…I felt victimized by the universe. I thought about that Nietzsche quote. “That which does not kill you makes you stronger.” I meditated on it for a while and decided…well…that’s just a lie! What fool would say such a thing?! And that’s when Tiffany Sly was born. I wanted to explore trauma with a young audience. What happens when what doesn’t kill you doesn’t make you stronger? What does life look like after life breaks your heart? It’s heavy subject matter but I wanted to infuse the story with hope and life and laughter. I came out of my trauma transformed and wiser. Sometimes we have an idea of what our life will be or even what our life should be. This journey is about doing the best you can and finding peace with where you are. I felt compelled to create the world of Tiffany Sly to bring awareness to mental health in the hope that we can start having more discussions about mental health in the African American community. Oftentimes the after-effect of trauma is mental illness. And so we have a young girl battling anxiety. The book starts off with her dealing with some pretty intense fears and anxieties… convinced her plane is about to crash even though it’s landing and all is well. But since Tiffany lost her mom she is sort of waiting for the next ball to drop. When we’re kids, we sort of feel invincible. And this story starts off with Tiffany becoming aware that she is in fact, not invincible, and trying to navigate life with this new realization. There are strong spiritual themes as well because for me going through trauma sort of makes you question all that you were and are. And oftentimes religion is tough to hold on to when life is hurting you. So Tiffany is in the beginning stages of discovering a new way to connect to spirituality. I really wanted to speak to today’s youth about the idea of active prayer. It’s one thing to ask for help. It’s quite another to take the steps to be the change you wish to see in the world. I know that sounds cliché. But it’s a powerful message. Also…we don’t have to live our lives to make others happy. We can redefine what we need to in order to serve our highest good. We get to carve out our own paths. 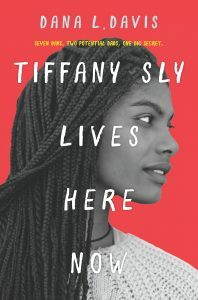 When I started writing Tiffany Sly Lives Here Now, my daughter was two years old, so I would write when she slept. Which was typically from 7pm to around midnight and I would also wake early around 4am or 5am to write before she woke for the morning. It took me about two years of this crazy (very little sleep) schedule. When I finished the book, it felt like I had gone through a time warp since I hadn’t really watched TV or connected to news. I literally did nothing but work, write, parent, sleep. Repeat. Thankfully my kiddo is in school now and doing really well with an aide who supervises her during the day. So I have peace of mind while she’s at school. I write now from about 8am until 2pm. I also write from 8pm until 10pm. I try to take weekends off and check in with Netflix and such. Ha! It’s important to have a balance. And now that I’m back to working as an actress I sometimes don’t have my days free to write. So I do still wake at 5am to write from time to time. I truly try to squeeze every minute out of every day. And also…I enjoy writing so much that it feels like a privilege. Escaping into a world I’ve created. So while waking at 5 might sound kind of torturous, it’s actually such a magical hour. Everyone is sleep. There is this peace about the house and the city is quiet. It’s a lovely time to get work done. 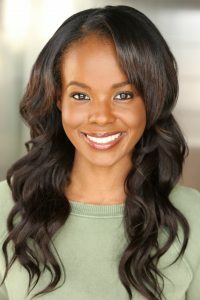 Dana Davis is the author of Tiffany Sly Lives Here Now, on sale now. 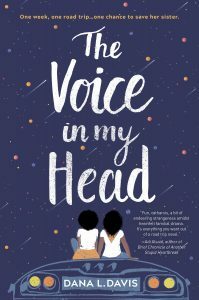 Her second novel, The Voice In My Head is forthcoming in May from Inkyard Press/Harpercollins. I cannot WAIT for this second book, too. What an amazing cover! I love it so much – I’ve never seen black-girls-on-a-car before as a cover theme. It’s beautiful.